Our Year Six debating team of Thomas, Cara and Joe participated in a cluster debating event at Treorchy Comprehensive this evening. Along with pupils from the other Year 6 classes in our cluster primary schools they were tutored by the Year 11 pupils at Treorchy Comprehensive and Mr. Lewis from the English department. They were able to learn how to develop skills in researching their topic, writing speeches and presenting them to an audience. 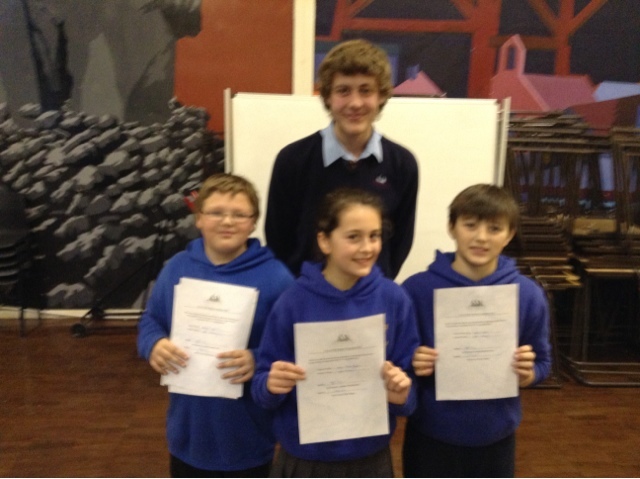 They were presented with certificates by former pupil Josh Wilson, a member of the Year 11 debating team. Hopefully they will develop their talents like Josh has an emulate him end his fellow debaters in achieving success for their schools.